The database preloader now builds the site, subscribes to one feed (this blog, using the same call as is performed when POSTing to the SubscriptionList), and polls that feed once. It’s still pretty hacky, but it works. Theoretically I could write a little cron job to continue to poll the feed(s), and the inbox would be continuously updated. I could subscribe to more feeds, and so forth. I’m getting, as the current fashionable phrase says, way out over my skis when it comes to tests, documentation, and so forth, so tomorrow will be all housecleaning. Next week, all kinds of bug fixes. Here are some of the big ones. Taking a deeper look at the plugins. Currently objects aren’t (re)blessed into those libraries, which is not how I usually do it and seems like a misuse of the OO system. Figuring out best-practices for representing ordered lists in RDF (Current hack is to sort the inbox entries by url, which works for a single poll of a single already-sorted feed but breaks down completely after that). Making the plugins select the templates. 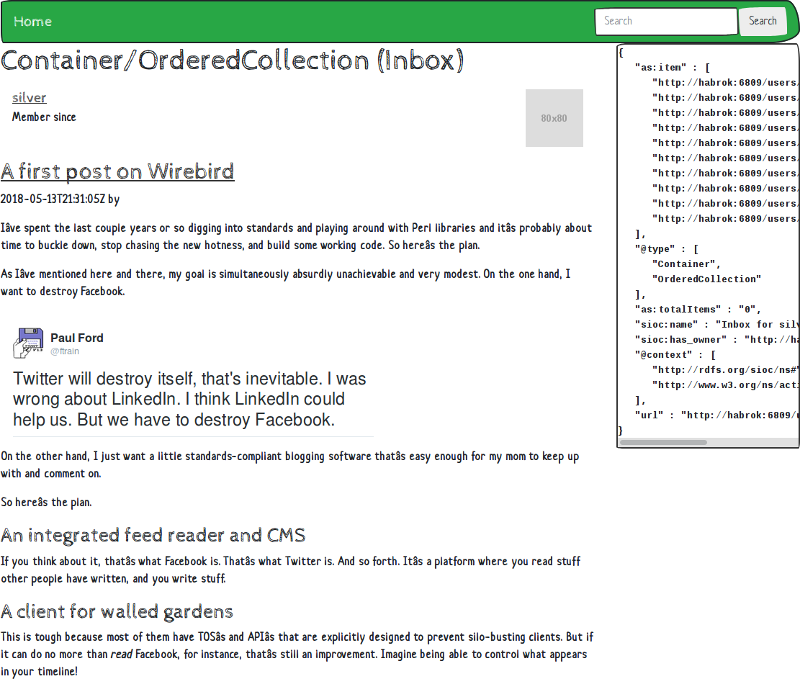 Currently it just concatenates all the types it finds, but container_orderedcollection is not always going to be an Inbox down the road.